One of the most unique historic landmarks in Red Deer is the solitary bridge pillar which stands along Taylor Dr., halfway between the intersections with 32 and 43 Sts. It is a reminder of a very ambitious venture from the years before the First World War. That was the Alberta Central Railway, a largely local attempt to build a "transcontinental" rail line across Western Canada. The origins of the Alberta Central go back to May 1901 when a charter was granted by the federal government to a group of Red Deer and Ontario businessmen. Originally, a rail line was authorized to run from Coal Banks, near modern day Delburne, to Rocky Mountain House. However, as the great settlement boom built momentum across Central Alberta, the plans were expanded to run the line from the Fraser Valley, through the Yellowhead Pass to Moose Jaw, with extensions to Saskatoon and the Hudson Bay. One of the key backers of the Alberta Central was John T. Moore. Originally a chartered accountant, he had been the managing director of the Saskatchewan Land and Homestead Company. That company, on Moore's recommendation, had purchased more than 115,000 acres of land in the Red Deer area. The company's lands were laid out in a rectangle, with Red Deer in the middle. The plans for the Alberta Central offered a way of opening up the districts to the east and west of Red Deer, thereby making the S.L.H. Co.'s holdings much more valuable. Moreover, John T. Moore was very ambitious politically. Constructing railroads was good politics. He ran successfully in the 1905 Alberta provincial election and became Red Deer's first M.L.A. He ran unsuccessfully for the nomination in the 1908 federal election and for re-election in the 1909 provincial election. In each of the campaigns, the promise of construction of the Alberta Central was used by Moore to garner votes. In fact, in the 1908 contest, a mysterious surveyor showed up to plant survey stakes in politically important areas. Eventually, people began to tire of the surplus of promises and lack of concrete action. Demands were made that the Alberta Central either start immediate construction or else sell its charter to a more bona-fide railroad company. Action finally came in April 1909 when the federal government offered a subsidy of $6400 per mile for a rail line constructed between Red Deer and Rocky Mountain House. Soon crews of surveyors were out laying out a rail line. Some grading work began in the spring of 1910. A real coup for Moore came in August 1910 when he was able to get the Prime Minister of Canada, Sir Wilfred Laurier, and the federal Minister of Railways, George Graham, to drive the first spike for the Alberta Central on a site very close to the present location of the Capri Hotel. 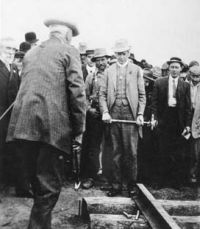 Sir Wilfred Laurier driving the first spike for the Alberta Central Railway, August 10, 1910. Sir Wilfred Laurier, Prime Minister of Canada, and Duncan Marshall, Provincial Minister of Agriculture. The dream of the Alberta Central finally seemed to be becoming a reality. Then a series of serious setbacks took place. In late 1910, the Canadian Northern Western Railway began construction of a competing line just north of the A.C.R. Having not one but two railroads being built, literally side by side, drove up construction costs dramatically. Moore and his business colleagues had grand plans, but not a lot of money. Finally, in late 1911, an agreement was struck with the Canadian Pacific to take over the A.C.R. and the construction of the line. While there was some talk that the C.P.R. would continue the full plans for the Alberta Central, all that was completed was the portion of the line between Red Deer and Rocky Mountain House. While a small station and yards were built where the Mountview Fire Hall stands today, the C.P.R. really never used it, preferring to use the main station and yards in downtown Red Deer. With the Mountview yards not being used, the bridges across the Kin Canyon and Waskasoo Creek were not needed. The superstructures were removed. With the Waskasoo Creek bridge, two concrete pillars were soon all that were left. When the new Taylor Dr. was built several years ago, one of those pillars was removed, leaving a solitary sentinel as a testimony to the grand dreams of the Alberta Central's pioneer entrepreneurs.